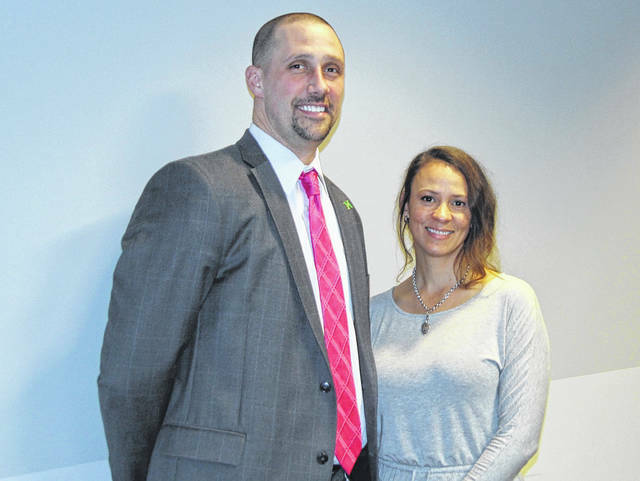 Tera Spears is pictured with Northmont Middle School Principal Jarrod Brumbaugh. Photo by Michael W. Barrow, M.D. ENGLEWOOD — Meeting at the Miami Valley Career Technology Center as a temporary venue, the Northmont Rotary enjoyed a delicious meal by Northmont catering. Terra Spears, Northmont Middle School faculty, spoke to the group about the WEB program. WEB (Where Everybody Belongs) is a program to help seventh graders learn more about the middle school and to become more connected. Through this program, eighth grade student leaders have received training in the summer to help new students transition to middle school. This is much like the LINK Crew, which is a high school program, where upperclassmen help freshmen transition to the high school level. Mrs. Spears also works with new families and at-risk students to optimize their experience at the middle school and to support them in their educational process. The Northmont Rotary Club meets at noon each Tuesday at Good Samaritan North Health Center, 9000 N. Main St., Englewood. https://www.englewoodindependent.com/wp-content/uploads/sites/26/2018/02/web1_Rotary_TeraSpears.jpgTera Spears is pictured with Northmont Middle School Principal Jarrod Brumbaugh. Photo by Michael W. Barrow, M.D.